Violist Roger Myers has received wide acclaim for his performances of a wide-ranging repertoire, spanning the Baroque to the modern day. As one of today’s foremost proponents of the viola, his performances and recording are helping to expand the modern viola repertoire. 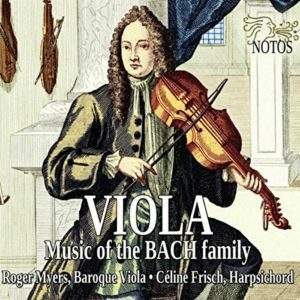 This is the latest CD from violist Roger Myers and features works for viola & harpsichord by CPE Bach, JCF Bach, WF Bach, JS Bach, and a historic World Premiere recording of a recently discovered work by J. J. Quantz. 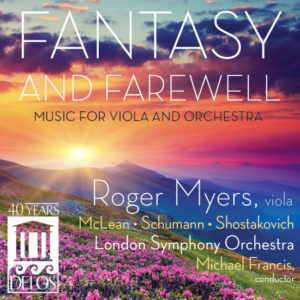 Fantasy and Farewell from violist Roger Myers and features works for viola & orchestra by McLean, Schumann & Shostakovich, performed with the London Symphony Orchestra, and features the World Premiere recording of Michael McLean's "Suite for Viola and Orchestra". McLean has a player's understanding of how best to present the viola in a solo role, and has written idiomatic passagework and sonorous cadenzas that Myers seizes gratefully, with consistently beautiful tone and unshakeable aplomb. The McLean Suite is an intensely emotional, deeply moving, and stunningly beautiful piece, it's a magnificent and important addition to the viola concerto literature. Violist Roger Myers, who plays the piece gorgeously, can be thrilled with the result of his commission.